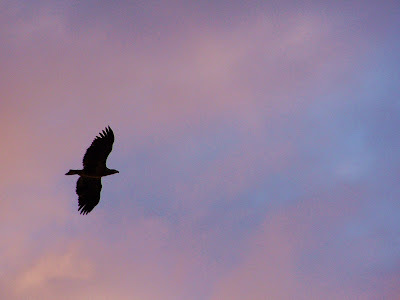 I was taking photos of the sunset last evening, which you can view on my other blog, when two eagles decided to grace me with their presence. They looked like females and I am not sure if they are Bald Eagles or not. I had to place my camera on the “action” setting to capture them in motion. This is the only one that did not come out blurry.